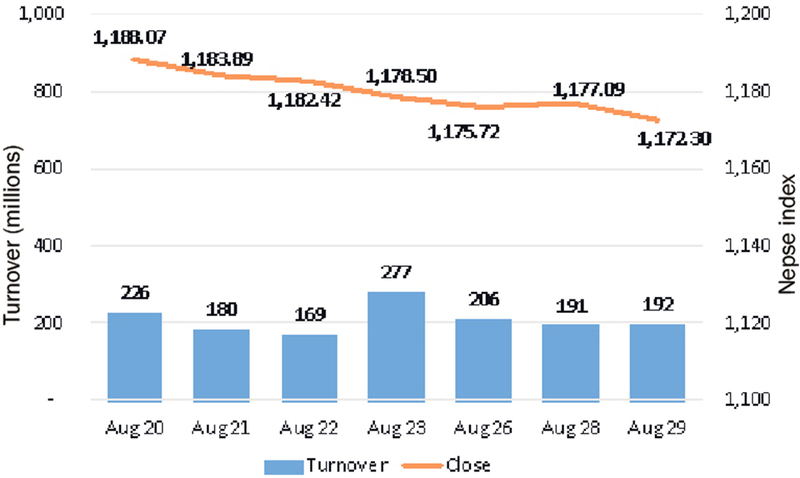 KATHMANDU, Aug 30: After posting a modest gain in the earlier trading session, stocks ended lower on Wednesday. 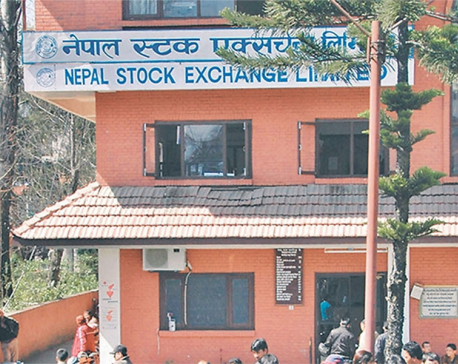 Subsequently, the benchmark Nepal Stock Exchange (Nepse) index pared all its previous gains and posted a loss of 4.79 points to close at 1,172.30 points. Lack of enthusiasm prevailed among investors as trading activity showed no sign of improvement. Absence of major news contributed toward another dreary session as only Rs 192 million worth of shares changed hands on the day. On the sectoral front, all major sub-indices mirrored the broader stock market and closed mildly lower. Manufacturing & Processing stocks suffered the most as its sub-index dropped 0.79 percent. Further, sub-indices of Life Insurance, Microfinance and 'Others' segments sank 0.69 percent, 0.66 percent, and 0.63 percent, respectively. Meanwhile, sub-index of Banking group, the heavyweight market segment in the secondary market, posted a modest loss of 0.24 percent. In terms of market activity, Nepal Investment Bank Ltd logged the highest turnover as Rs 13 million worth of its shares were traded on the day. Other commercial banks' stocks followed suit, with NMB Bank Ltd and Mega Bank Ltd posting turnovers of over Rs 8 million each. Nepal Life Insurance Company Ltd's scrip also registered a total transaction of Rs 8 million. Chilime Hydropower Company Ltd, Life Insurance Company Nepal and NIC Asia Bank Ltd were among other active stocks on the day. Ngadi Group Power Ltd led the list of gaining stocks as it added 4.14 percent on its share price. The company announced its book closure on Wednesday ahead of its annual general meeting (AGM) scheduled for September 20. The company has announced 10 percent bonus share to its shareholders. Further, endorsement of 30 percent right shares is also one of the agendas for its meeting. Second on the list, NMB Microfinance Bittiya Sanstha Ltd saw its share price go up by 4 percent. Likewise, share price of Ridi Hydropower Company Ltd also increased by 3.60 percent, while share price of Khanikhola Hydropower Company Ltd was up 2.91 percent. Sagarmatha Insurance Company Ltd also saw its share price surge by 1.97 percent after the company reported a year-on-year net profit growth of 20 percent as per its earnings report of the fourth quarter of Fiscal Year 2017/18. Conversely, Kalika Microcredit Development Bank Ltd was the worst performer of the day as its share price tumbled by over 5 percent. Besides, Microfinance stocks came under pressure on the day as share prices of Naya Nepal Laghubitta Bikas Bank Ltd, Kisan Microfinance Bittiya Sanstha Ltd and Samata Microfinance Bittiya Sanstha Ltd fell by over 3 percent each. Other top losing stocks include Bottlers Nepal (Terai) Ltd, Central Finance Company Ltd and Nepal Hydro Developers Ltd.
ARKS technical analysis model indicates the market continuing its bear run despite making a slight recovery in the previous day. Relative Strength Index (RSI) indicates further weakening momentum, while Moving Average Convergence & Divergence still trends in the negative territory. 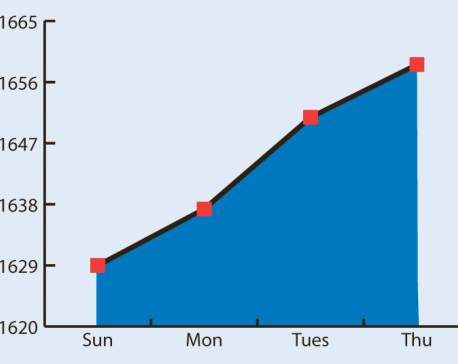 Hence, the bourse is yet to show a significant sign of recovery. Further, a breakout of the immediate support at 1,163 points might signal another short-term downfall for the index.